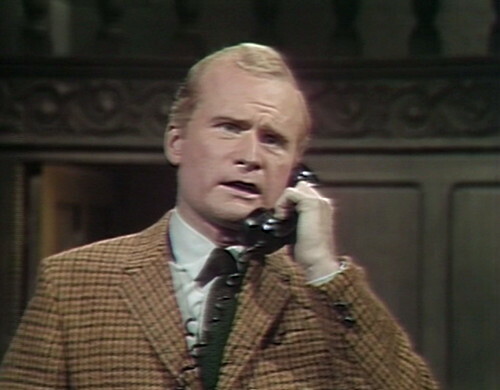 Today’s episode begins with Roger in the foyer, on the verge of a phone call. He’s interrupted when Cassandra and Julia enter, all smiles. Roger: Cassandra! Where have you been? Cassandra: I took Julia to see Professor Stokes. Julia: Yes, we had a fascinating conversation about the occult. Roger: Well, never mind about that now. David was very nearly killed this evening. But that’s not even the weird part. 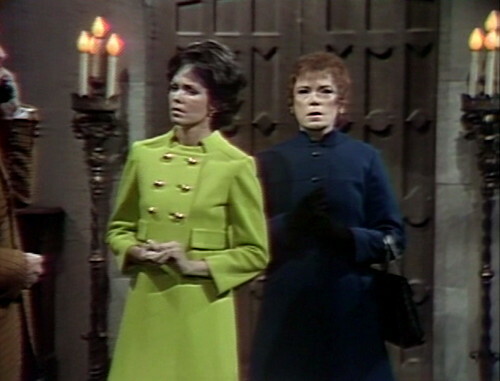 The real problem here is: Julia knows that Cassandra is actually Angelique, the evil witch who’s cast a Dream Curse on Barnabas. So why are they hanging out together? And on Cassandra’s side, if she’s trying to throw off suspicion, wouldn’t a fascinating conversation about the occult be the very last thing she’d want to encourage? The only way to make sense of this scene is to just decide that Julia and Cassandra are complicated women with rich interior lives, and they don’t answer to you. You are not the boss of them. Anyway, Roger’s upset because he just found his ten-year-old son outside in the woods, in the arms of a six-foot-six Frankenstein man, and that kind of thing can rattle a person. He pauses as the officer asks a question. “Yes,” he says. “I did.” This is one of those conversations that makes police officers in soap opera towns wonder why they even bother to pick up the phone. Roger describes the man that he shot — an enormous man, over six feet, dressed all in black, with some kind of facial disfigurement. Julia does one of those thoughtful takes to the camera, which pulls in obligingly on her expression. It’s the kind of moment that really cries out for one of those mockumentary fourth-wall-breaking monologues, like on Modern Family. Julia excuses herself and exits the scene, and now it’s Roger’s turn to watch the audience. 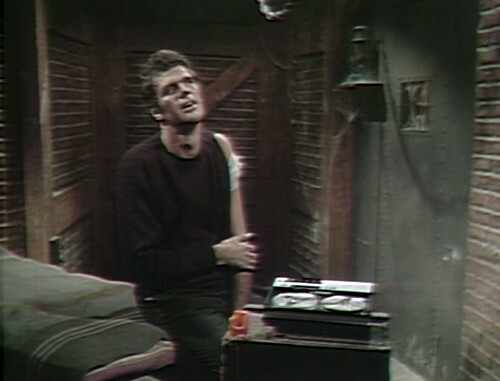 He’s telling Cassandra about the stranger who was trying to abduct David, and he uses the typical Dark Shadows trick of pretending to be moody and distant, so he can keep one eye on the teleprompter. Naturally, the other eye is also on the teleprompter. Eyes tend to stick together like that; they don’t like solo missions. Roger: Liz was returning from the Old House, and she encountered this man in the woods. He frightened her, and she came running here to tell us about it. I knew David was out playing, and I got a gun, and went out looking for him. Barnabas went with me. Roger: Yes. As a matter of fact, but for Barnabas’ quick thinking, David might not be here now. Well, he’s not here now. Oh, I see what you mean. After a while, they settle into a shot where they can both refer to the teleprompter. There’s been a lot of this lately; it’s like an epidemic. We’re just getting into a period where ABC realizes that Dark Shadows is starting to do really well in the ratings. This week, they send Jonathan Frid out on a week-long promotional tour, which throws the taping schedule into chaos. 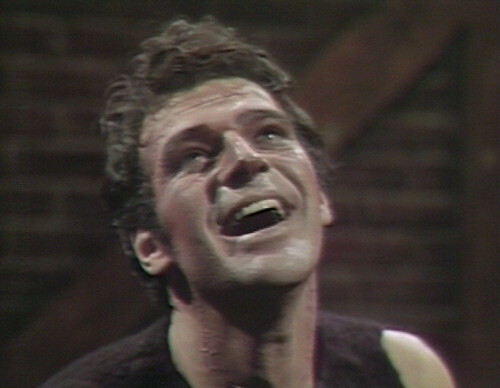 Barnabas is at the heart of every storyline right now, and they can’t just drop him from the show for five days, so they start filming episodes out of order. Within a couple weeks, they’re jumping around so much that they’ll tape 516 on a Tuesday, followed by 505 two days later. In fact, tomorrow’s episode was taped on the day before broadcast — a fairly nerve-wracking thing to do. This only happens four times in the entire run of the show, and all four of them are in the next few weeks. So it’s not surprising that things are starting to get a little ragged. It’s hard enough for soap opera actors to remember their lines under the best of circumstances, what with all the recap and repetition. When you’re taping episodes weeks out of order, you lose the context completely. Even Grayson Hall starts relying on the prompter, and she’s usually on top of her dialogue. Everybody’s a little confused. So we get a lot of backacting, and peering off into the distance. 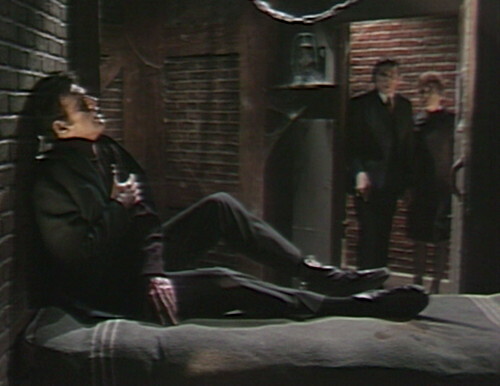 Anyway, Barnabas and Julia find the wounded Adam back in his basement cell, where he returned after Roger shot him in the shoulder. Adam is hurt and confused, which makes him pose dramatically like a pinup model. Robert Rodan is so huge that he’s basically furniture; they just build the scene around him. Julia has to treat the gunshot wound, so it’s lucky that her purse has magically turned into her doctor’s bag between scenes. She pulls out a pair of scissors, and cuts all the way up Adam’s sleeve. Now, he was just born a little over a week ago, and as far as I know, this is his only outfit. But I think he’s cute, so if Julia wants to start editing his wardrobe like this, it’s fine with me. Good-looking soap dudes should get shot in the shoulder more often. But life is pretty easy for Robert Rodan today. Adam doesn’t have a very large vocabulary so far, and today he only speaks three words, all of them in the last scene. 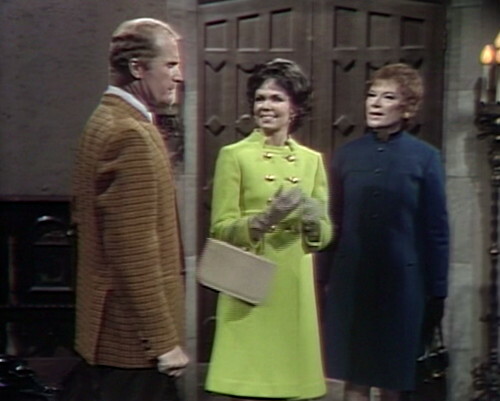 While Julia makes with the medicine, Barnabas decides that he needs to get to Collinwood and make sure that the police aren’t going to start prowling around the Old House, looking for the intruder. But as he turns for the door, the stricken monster calls out. Apparently, Adam thinks that getting shot in the shoulder should earn him more than a minute and a half of Barnabas’ time. Barnabas: What did you do to him? Julia: Nothing. He doesn’t want you to go. Barnabas: Well, I can’t stand by him twenty-four hours a day. Man, Barnabas is really competing for that Father of the Year award, isn’t he? It’s a heartwarming storyline. 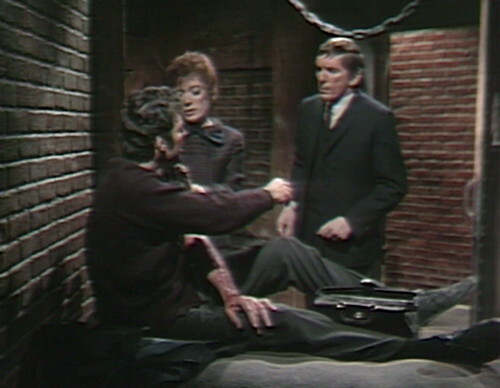 But Barnabas manages to disentangle himself from the emergency room, and he heads over to Collinwood for damage control. Roger is still striking dramatic backacting poses. Roger: Have you ever seen that man before, Barnabas? Barnabas: What made you ask that? Well, it’s written right over there, on the teleprompter. You should recognize it; it’s been directly in your line of sight for over a year now. So it’s just that kind of day; everybody’s cutting corners with the dialogue. By the last scene, the whole show just gives up completely, and they run the tape. Julia’s been in the room with Adam for more than two minutes, so obviously she’s itching to leave. Adam gestures at the door and says, “Music!” He says it three times. It’s the only word he has to say all day, the lucky stiff. 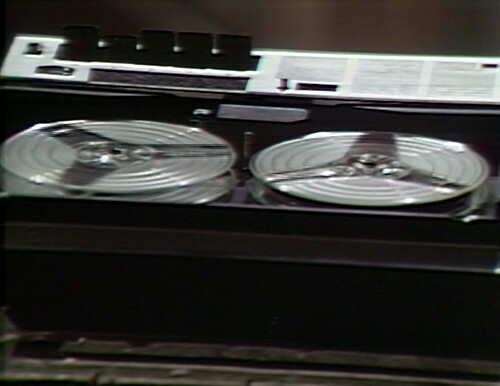 This tape recorder was liberated from Dr. Lang’s secret laboratory. 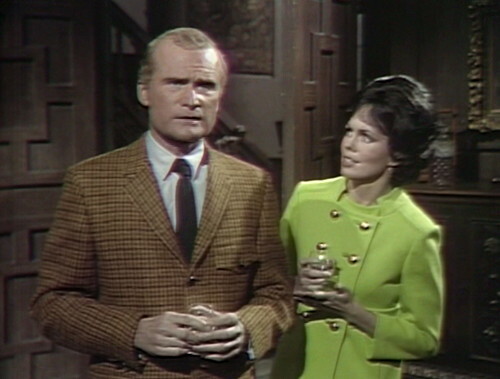 After Lang died mysteriously and Adam busted up the lab, Barnabas and Julia swiped the tape recorder. Who knows what else they took; apparently they treated the crime scene like a garage sale. Anyway, they’ve brought the tape recorder down to Adam’s cell, and it’s pretty much the only thing he ever gets to interact with, so he’s pretty fond of it. The tape is Mozart’s “Eine kleine Nachtsmusik,” and in the middle of the song, there’s a plot-recap message that Lang recorded just before he died. 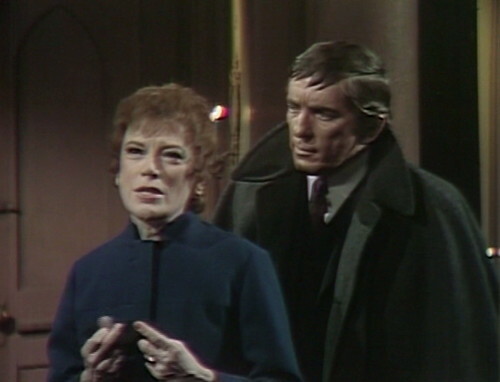 He was trying to tell Julia that if they succeeded in using Barnabas’ life force to animate Adam’s corpse, then Adam would drain Barnabas’ vampire energy, and let him live as a normal human. It’s a complicated little bit of plot contrivance that none of the characters actually know, so every once in a while they turn on the music and let Lang explain it to the audience, like it’s a public service announcement. It goes on for 52 seconds, so it’s fairly excruciating for anyone who’s already absorbed the plot point. They finally killed Lang off, but here he is, still nattering away. But look at little Adam’s face; he’s adorable. That’s the look of a man who only had to memorize one word today. Well, as long as somebody’s happy. This show is now trying to do too many crazy things at once and is now tripping over itself. They have two major supernatural storylines bumping up against each other and can’t keep track of who is supposed to be doing what with whom at this point. I can see why Alexandra Moltke was becoming disillusioned with the show at this point..so was I. There was a certain change in the whole ‘aura’ of the show after the Vicki/Barnabas car crash which it really never regained. It did get better after ‘Adam and Eve’ ended but never totally recaptured the magic and lingering terror of the early Barnabas days. It now feels like being trapped in an amusement park House of Horrors, good for a quick thrill but totally forgettable several hours later. 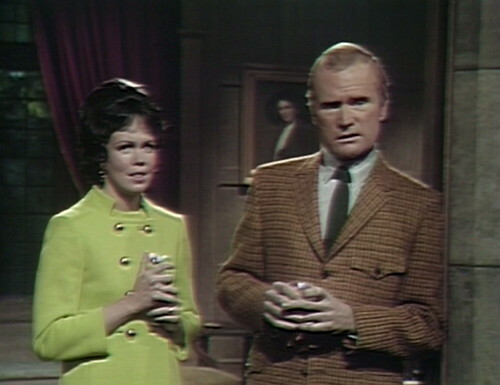 Unfortunately, a lot of the 1968 episodes are a bit irritating – not irritating-fun like Addison Powell, but irritating-irritating like Roger Davis. The writers just do not know what to do with the material, and keep stumbling along, with us tagging behind. And the Dream Curse and Adam are frustrating distance from each other — not really connected but not disconnected either. Jonathan Frid has commented more recently about how he disliked it when they moved the teleprompters onto the cameras themselves directly below the lens, because this would give an actor away when they turned to look at the camera for help, whereas before the teleprompters were off to the side on stanchions, which gave an actor a chance to add an extra dimension to their character–for instance, an elder actor when looking off to the side as they spoke could appear more thoughtful and wise, and so on. But I wonder if placing the teleprompter on the cameras, in helping to break a fourth-wall convention unintentionally, may have brought the viewer more into the action and as a result made them feel more a part of the show. Because unlike before actors were suddenly looking directly at the cameras as if to include the viewer in their conversations, as if aware of the viewer being there “in the room with them”. I know that wasn’t intended, but I wonder if any other viewers had that impression. 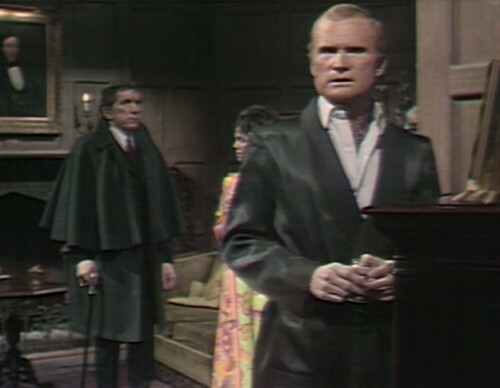 A minor blooper–when Barnabas and Julia decide to search the house for Adam, Barnabas hangs up his cloak on the coat rack but also hangs up his cane. 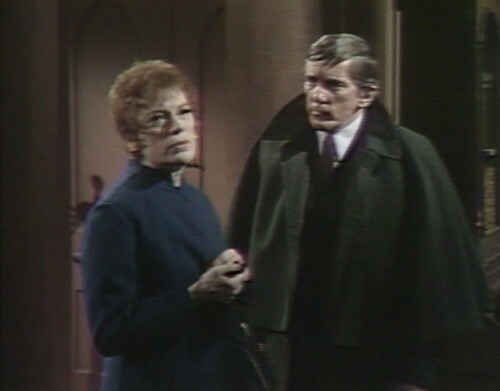 However, when Barnabas and Julia go downstairs, Barnabas has his cane again. Also, why is Julia’s medical bag at the Old House? Julia just came rushing to the Old House from Collinwood (where she lives). But when they decide to go downstairs, Barnabas says she’d better get her medical bag. Julia walks into the parlor and gets it. One other thing I’ve noticed since we’ve returned from 1795–When we went to 1795, the Old House set was spiffed up like new, including a paint job. The walls in the front hallway, the doors, and the pillars to the parlor were painted an orangey/pink color. They were of a more natural wood color and texture in 1967/1968. However, after the 1795 storyline is over, they didn’t restore the Old House set completely to its prior 1967 state–the set’s been dirtied up a bit, but the 1795 paint job is still there. Why is Julia’s bag at the old house? Haha! Absolutely love this theory, David! This is potentially by favorite episode, especially this DS version of the trite sweet scene wherein the new father eagerly greets his lover with the news that their clever child just spoke his first word–“Dahdah”–awww. Precious. I didn’t care for this story line but his part with Adam, Julia and Barnabas is so cute. Julia was acting like “mommie” and Barnabas acting like “daddie ” that got so much else to do…lol. Barnabas grabs the cane again after hanging up his coat. The pillar is kind of in the way of the shot (not to mention the coat) but you can just see the handle moving to the right as he slips it off the stand. Presumably he only hung it up in order to get out of the coat. I see some logic in the neck scar, given his piecemeal construction and the fact that Lang mentioned several times (oh, not mentioned, bellowed) that he was looking for a head. I even can stretch a bit to the forehead scar, possibly a brain transplant (“Abby…someone.” “Abby…Normal?”) or the often-discussed ‘face’ that was nearly Jeff Clark’s. What can possibly be the reason for the scars on his face!? Cheek reduction surgery? Cheekbone implants? A REALLY botched nosejob? An equally inept eyeball insertion? Or was Lang just making sure those sinuses were absolutely clean (who wants a Phlegmenstein, after all)? I always thought that we started this episode in one of those alternate timelines – you know, where a particular line of dialogue in the recap is different, or where the reaction to a line is utterly altered between the end of one episode and the start of the next. Maybe we briefly dropped into one where Julia does NOT know about Cassandra? She never gets a chance to talk about her this time around, does she, and Cassandra’s not up to her usual hijinks, either. Naturally we will be back in the DS Prime universe once we’ve finished this brief trip sideways, but it’s a fun possibility, anyway.